GnackTrackR6 Released , available for Download ! 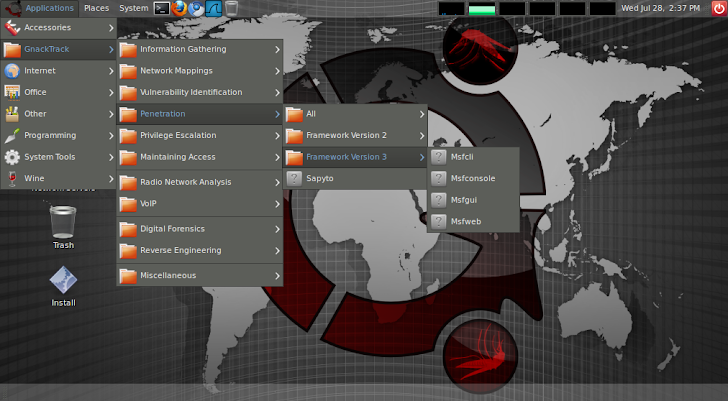 GnackTrack is a Live (and installable) Linux distribution designed for Penetration Testing and is based on Ubuntu. Although this sounds like BackTrack, it is most certainly not; it's very similar but based on the much loved GNOME! GnackTrackR6 has just been released. This version has many wireless patches precompiled in and also has the latest version of kismet, wireshark, xplico, metasploit, nmap, beef, w3af, aircrack, armitage and much more. GnackTrackR6 can be run live from DVD or USB and can also be installed natively. There is also a VMWare image available for those that test from within a virtual machine. The Developers are constantly taking new requests for tools and adding them pretty quickly.